As Phil remarked, 'it's all come together'. We cleared the decks, did loads of planting, and the annotated photo on this posts shows the full range of what we now have on the balcony. Can't quite believe it's all come together in a couple of months. It was great to get the potatoes planted out today in their bags, the peppers into their pots, and now 4 chard plants in pots. The courgettes are flourishing although they have very weak stems, so I was a bit concerned to read on another blog that people get 40, yes, 40 courgettes per plant! Also added a couple more lobelia to the window pots. Should be great when it's all trailing down over the top of the tomatoes. The lettuces are doing fine, but I think we're going to need a bit more salad and lettuces, so going to buy another two long pots to grow those in. And plant a couple more courgette seeds in case we have a stem snapping disaster. 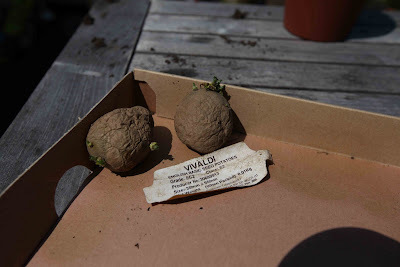 Another addition to the blog - check out the planting calendar where I'll be adding all the things we've planted and when. Will be good to check back and see how long everything took to germinate / fruit. - Far brighter than this gaudy melon-flower! By Robert Browning (1812-1889) , from "Home-thoughts, from Abroad". Couldn't resist including some photos of the acer and the seedling peppers, chard, tomatoes, tarragon and basil. Trying to give them some extra light and warmth during the day, when the weather's good. Note the super straggly chard seedlings. Going to give them about another week and then consider re-sowing. This is the acer which survived the hard Hamburg winter. -18c at the lowest point, and this pot was entirely covered in snow. I was convinced it was dead but with spring came the first little sign of life and now this! Quite miraculous. The new lemon tree enjoying the sun next to the carrot seedlings on the right, and salad and lettuce on the left. The carrots aren't visible here but are now just poking about the soil. Counted 10 tonight. Salad leaves in the long pots I used last year. As with everything else just 2 weeks since sowing. Don't buy shop salad - this is so easier and will last the whole summer! The aggressive climbing courgette, only two weeks from the point of sowing. Looking fantastic here in the tomato pots from last year. Looking at all these photos makes me think about how much space we have left. We still have the chard, peppers, tomatoes, pea wigwam and 3 sacks of potatoes to fit in. The potatoes will go in next to the acer, which I'll post a picture of in a minute. The pea wigwam probably next to the carrots, and the peppers and tomatoes will probably have to fight for space with the courgettes in the sunniest spot. Actually, lettuces aren't great fans of sun, they might get moved round the corner with the potatoes, and we'll give the tomatoes and peas prime time sun position. This weekend is going to be buying big pots for the chard, creating wigwams for peas, and actually sowing the peas providing I can get hold of some seeds. 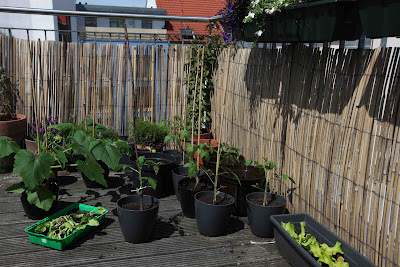 And ... going to buy some long pots to hang outside the balcony to fill with trailing flowers. Phew! The return to Hamburg has been a good one: the balcony has really come on and in my next post I'll be putting up a lot of Phil's photos. The good news is that everything grown from seed has sprouted (only one pepper seed though), and the seed potatoes and sacks are en route from the U.K. The only concern at the moment is the limp and leggy chard - advice much appreciated. 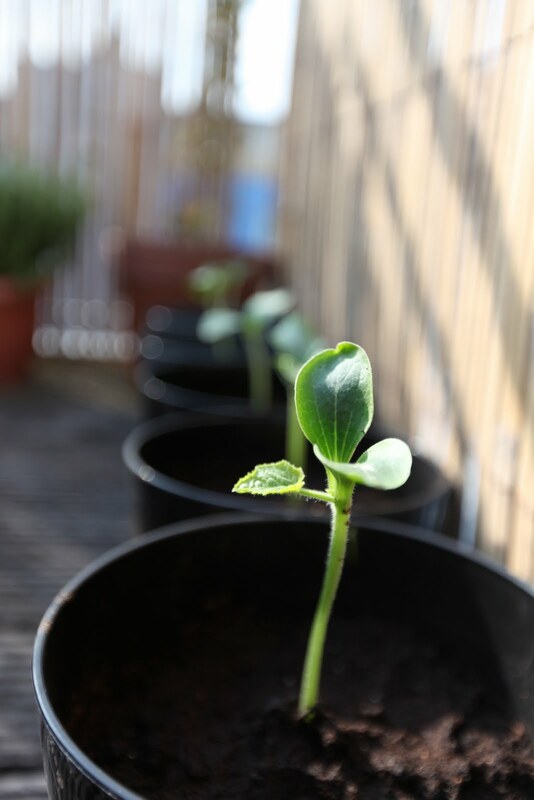 The aggressive courgettes have been potted out to start climbing up the windbreak, and all the other balcony plants seem very happy, including the new member of the family, Phil's lemon tree. He's also ordered all of the kit for our veg blog live webcam. 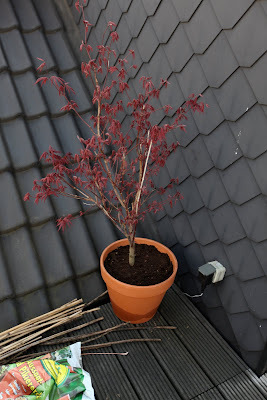 Not only will this be streaming live balcony video on this blog, but we're also going to try some time lapse photography to catch the summer in action. 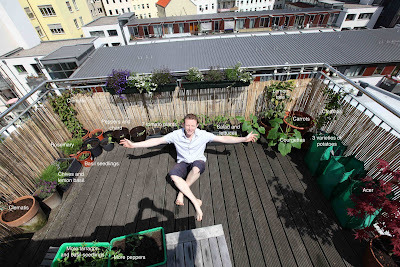 An odd blend of the back to basics grow your own food, and modern technology. When Phil got back on his two day epic, something had stirred in the land of seeds. The courgettes, in only 10 days from seed, had literally lifted up the top of the propagator. I don't think I've seen seeds accelerate like this before. Looks like climbing courgettes are going to be taking over the balcony this summer. On other fronts: tomatoes, herbs and chard have shown through. Nothing to show on the carrots or pepper side yet, but the carrots are predicted to take 14 days. And it has been truly horrific weather in Hamburg. Can't wait to get back and do some tendering. The garden is currently stranded as Phil and I are in the UK, awaiting volcanic ash to clear. Although Phil is going on a 2 day mission to get back and do some watering. Sterling effort. When I return to Hamburg I'll get posting photos and hopefully they'll be some sign of germination. Thanks to Phylis for posting about side shoots. Look forward to getting lots more people posting about their vegetable growing exploits this summer. With the aircraft ban maybe grow your own is the only way out of the crisis? I grow tomatoes in Cheshire, some in the greenhouse and some outside on the patio. They usually go into pots the size of buckets, which means they can be moved around, often necessary to ensure they stay watered when I am not around. No matter how vigilant I am hunting for sideshoots on my tomatoes, there's always one I miss. They even re-grow sneakily where I think I have already pinched them out. If I go away for a few days, there can be shoots several centimetres long, they grow at such a rate. But all is not lost. Instead of putting them all in the compost, I stick a few of the shoots into a glass of water and in about a week there are lovely little white roots, all ready for growing on. Free plants! They are particularly useful when the original plants are getting rather tired, as by then they are big enough to start fruiting. Last year I was able to extend the season for Sungella very successfully with a second generation and the cherry tomatoes Red Cherry grown from the shoots were still bearing heavily outside right until the frosts, though the taste was rather sharp and the skins tough. They were still useful cooked and pureed. Perhaps they were so small that they were still able to ripen despite the shorter days. 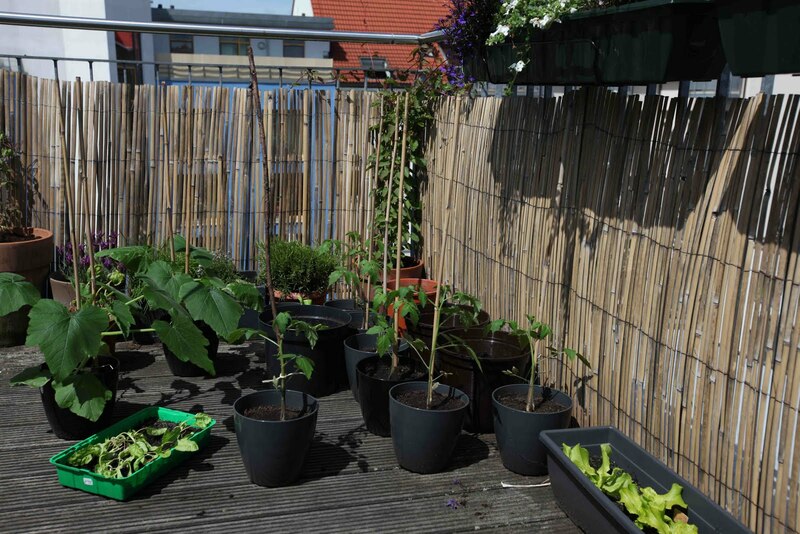 This year's plants, started on the windowsill in January, are coming along quite nicely, especially Legend and Marmande, but there is a long way to go to match the Hamburg crops. We finished up last year's blog on August 11th. The tomato season had been a good one; plenty of sun on the balcony and a bumper crop throughout August and September supplying us with plenty of salads and roasted tomato soup. With all of the green tomatoes I had left over, and with the wintry nights drawing in, I decided to make Delia Smith's green tomato chutney. Pans, sourcing vinegar and a food processor caused a few problems, but we prevailed and ended up with 6 litres of chutney. 6 months on and the maturation process has done it's job. Delicious. It's been a long hard winter here in Hamburg, but with the first glimpses of summer showing through, veg started to re-enter my thoughts. Phil's parents had very kindly bought me Vegetable Growing Month by Month for Christmas, so yesterday I browsed through and picked out some veg suitable for the balcony. We came up with chard, lettuce, salad leaves, rocket, courgette, peppers, tomatoes, peas and carrots. Although the limited garden centre didn't have everything, we found most seeds. Just potatoes and peas to source next weekend, and the peas have some time yet before they can go in.